Global Water's RG200 Rain Gauge is a durable weather instrument for monitoring rain rate and total rainfall. With minimal care, the rain gauge will provide many years of service. All rain gauges are constructed of high impact UV-protected plastic to provide reliable, low-cost rainfall monitoring. The simplicity of the rain gauge design assures trouble-free operation, yet provides accurate rainfall measurements. RG200 rain gauges have a 6" orifice and are shipped complete with mounting brackets and 50' of two-conductor cable. The rain gauge sensor mechanism activates a sealed reed switch that produces a contact closure for each 0.01" or 0.25 mm of rainfall. Global Water's iRIS 120 rain gauge data logger adds recording capabilities to the RG200 rain gauge. The datalogger connects to the rain gauge's pulse output to record data. In addition, Global Water offers the RG700 4-20mA Output Rain Gauge Converter Module to convert the rain gauge's pulse output to a current output for use with recording systems that receive 4-20mA signals. 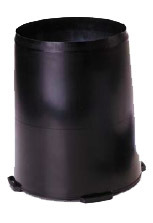 NOTE: If your application requires a more heavy-duty rain gauge, please see Global Water's RG600 8" Rain Gauge. Pulse to current converter. 32 pulses per minute equals 20mA.  RG600 TIPPING BUCKET RAIN GAUGE, 8"